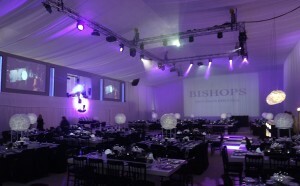 A full technical solution was provided for the Bishops High School Graduation this month. Structures consisting of a 12m x 6m truss grid was installed with over 40 intelligent lighting fixtures and four large format Christie Projectors. 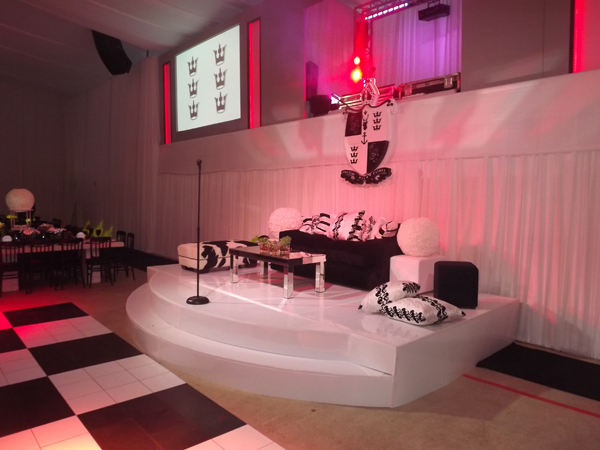 For the DJ area, as pictured above, we setup a grey backdrop with recessed screens, light boxes and box DJ cut out. We erected trussing structures fixed with LED lighting and effects. 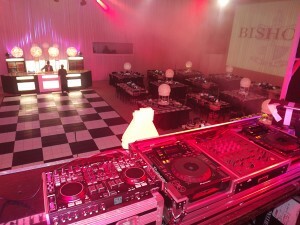 Pioneer DJ equipment was provided for the 2 nights which featured local act Pascal & Pearce. The technical team put together some stunning visuals using Arkaos and Pangolin software. We used the Stealth Club 7 laser which is a powerful full colour laser. 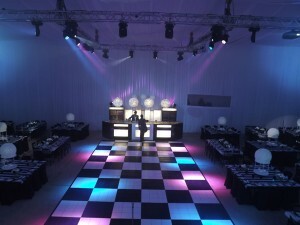 Blend Event Life setup a beautiful bar area which overlooked our 6m x 11m black & white dance floor. We also provided a gloss cladded white stage and a poly cut school crest, which can be seen below.